Items not collected/received by 23 April 2019 will be forfeited and no refund will be given. NOTE: Delivery service within Doha city limits ONLY. Any territory beyond the city limits will fall outside the delivery parameter. Inspire your kid’s creativity and imagination and let them doodle freely! Exercises hand-eye coordination, color perception ability. 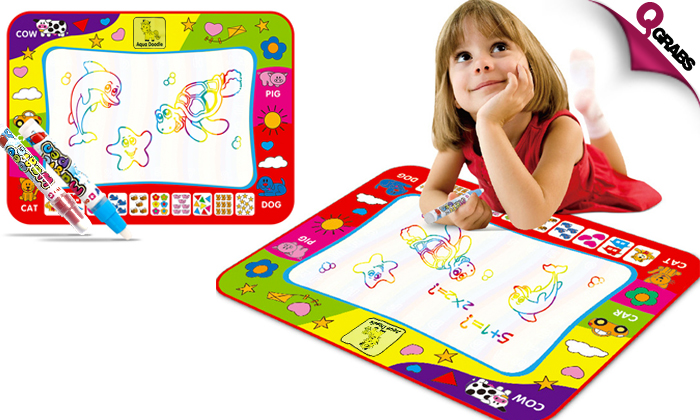 Just fill the magic pen with water and draw on the magic mat. Magically disappears after 3-10 minutes (depending on the temperature and air flow). Makes a great gift for kids. Environment-friendly with no use of ink or paint. Can be folded to a compact size, portable for travel. Draw, Paint or Write away with up to 50% off!